Litecoin has managed to hold on to the $60 level over the weekend despite the global crypto market sliding by $3 Billion. Over the last 14 days the asset has soared by more than 40%, from a low of $45.74 to a height of $64.24, before correcting. The announcement last week that Lisk will be joining the Litecoin Foundation and TokenPay joint venture seems to be the main bullish catalyst for driving LTC over the psychological price point. The recent surge in bullish momentum has meant that Litecoin is now the closest asset in the top 20 to achieving a golden crossover on the 1D chart - with the 50 EMA now tantalisingly close to the 200 EMA. This is a very positive bullish signal and indicates that short-term momentum is gaining strongly. 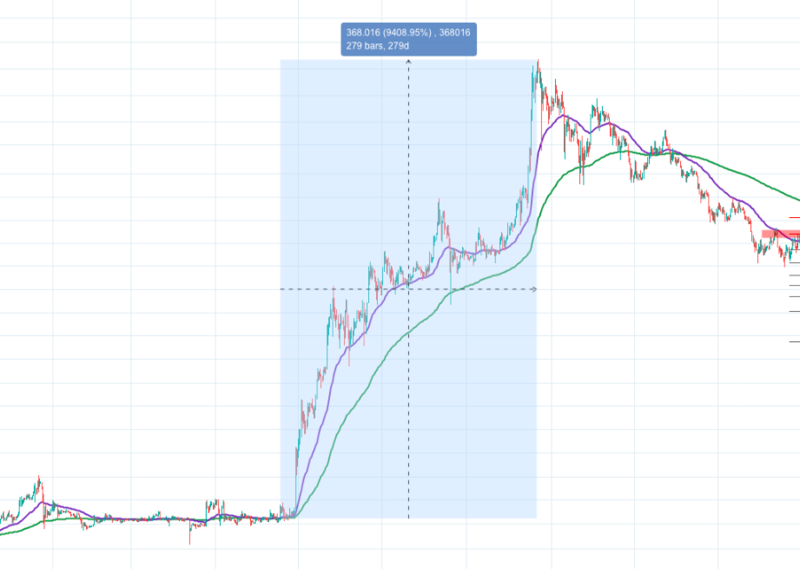 The last time Litecoin had a golden crossover on the 1D chart was almost exactly 2 years ago, on March 13 2017, where LTC would go on to explode by 9,400% from $3.79 to the all-time high at $372. This of course, is unlikely to happen again any time soon given the maturity of the crypto market now, but could still mark the start of a new bullish phase for Litecoin going into the rest of this year. 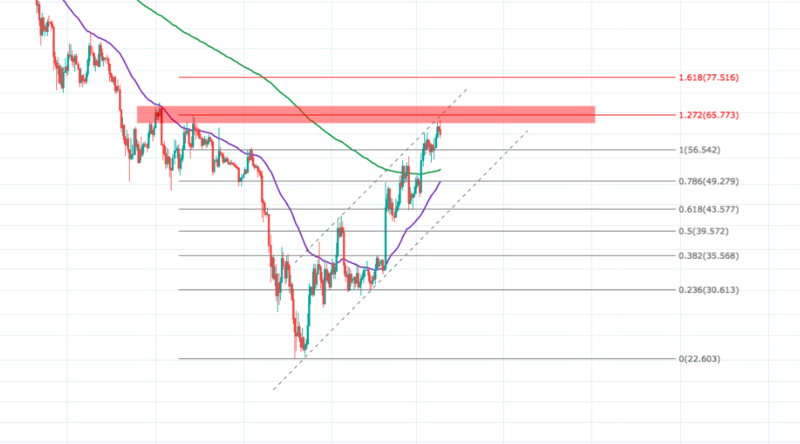 On the 1D LTC/USD chart we can see that Litecoin has been tracking inside an ascending channel for the last 100 days, between a strong rising support and resistance level. Increased bullish momentum over the last month has helped to lift the price action off the support and challenge the resistance 4 times, but with little success so far. 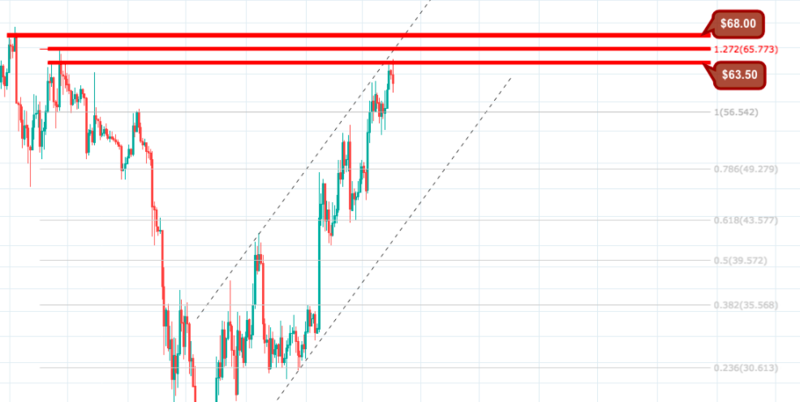 Right now LTC is closing in on a second major resistance area (red rectangle) which sits along the 1.272 fibonacci level around the $65 mark. Historically this area has been a strong resistance for Litecoin as far back as September 2018, and prevented LTC from recovering back above $60. If buying momentum flags at this crucial stage then we could see Litecoin unravel before the golden crossover occurs. On the MACD indicator, the 12MA has bullishly converged above the 26MA, with both moving averages still high above the signal line. The Aroon Up line is holding high above the Aroon Down line. The RSI has briefly corrected from the overbought line at 70%, but overall momentum is still following an upward trend. The Chaikin Money Flow indicator is also following an upward trend above the zero line. All ROIs are calculated from the asset’s current value at $60.60.